The Ohio State quarterback room looks very different than it did just one month ago. Dwayne Haskins? Off to the NFL. Tate Martell? Off to Miami. Even walk-on Kory Curtis transferred to Bryant University on Thursday night. Dwan Mathis, who was committed to join the Buckeyes right up until Early Signing Day on December 19, instead flipped and signed with Georgia. Two weeks later, Justin Fields arrived as the player-to-be-named-later in that unofficial trade with the Bulldogs. Oh, and there’s a new coach in charge of the unit as well, former Oklahoma State offensive coordinator Mike Yurcich. If you’re scoring at home, that’s one new coach in, one transfer in, and three current quarterbacks plus one commit out – all in the span of one month. Now that the dust has finally (presumably) settled, the Buckeyes have three scholarship quarterbacks plus one walk-on in the program. Fields is a sophomore, widely considered the favorite to win the starting job for this fall. He still needs to get a waiver from the NCAA to allow him to play in 2019. If Fields is 1A on the depth chart, then redshirt freshman Matthew Baldwin is 1B. Baldwin suffered a knee injury during the Texas state championship game in December 2017, and was limited during his first spring and summer camps with the Buckeyes. He is now healthy and ready to play, but hasn’t taken a snap in college yet. Redshirt senior Chris Chugunov was a grad transfer from West Virginia in August 2018. He played four snaps in the final minutes of the blowout win over Rutgers, and never saw the field again. Those four garbage-time snaps are the entirety of the returning experience for this unit. The fourth player left in the room is walk-on Daniel Vanatsky. He piled up impressive numbers as a high school player at Cincinnati Hills Christian Academy, and was a true freshman in 2018. A quarterback unit with a total of four career snaps as Buckeyes is probably a little scary for Yurcich and new head coach Ryan Day. Yes, Fields is very likely to be granted immediate eligibility. Yes, both he and Chugunov played meaningful snaps at their previous stops. However, even if Fields does play, the Buckeyes are one injury, suspension, or transfer away from being dangerously thin at the most important position on the field. Day has said before that he wants to have four scholarship quarterbacks on the roster at all times. But with quarterback transfers becoming the new norm, that is getting harder to do. Three of the top eight quarterbacks in the 2017 recruiting class: Hunter Johnson, Martell, and Sam Ehlinger, have already transferred or are currently in the transfer portal. For the 2016 class, three of the top four quarterbacks have now left the school they originally signed with: Shea Patterson went from Ole Miss to Michigan, Jacob Eason left Georgia for Washington, and Malik Henry left Florida State and is now at Nevada. The first step for Day is to add another scholarship player for 2019. That will likely mean a grad transfer similar to Chugunov. After that, the picture gets a little fuzzier. Chugunov will be out of eligibility following the 2019 season, and 4-star prospect Jack Miller is committed to join the team for 2020. 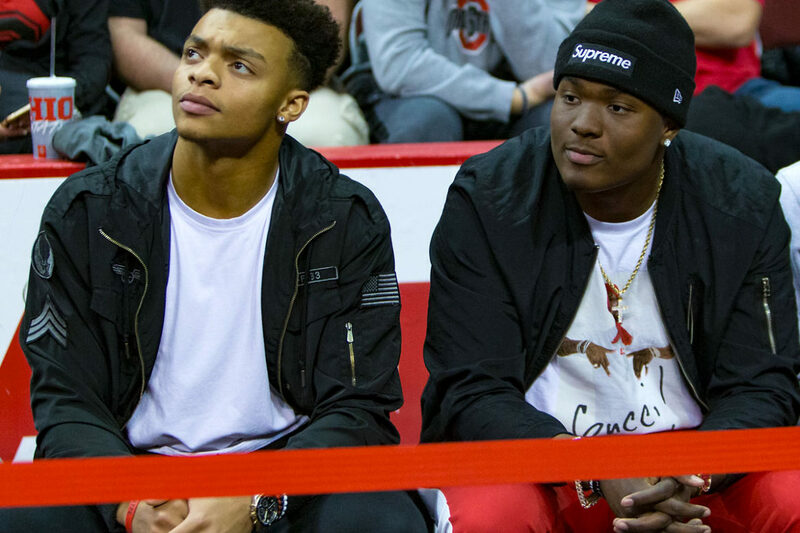 If the fourth scholarship player they add for 2019 only has one year of eligibility left, the Buckeyes will be back down to three scholarship quarterbacks again. At that point, will 2019’s backup quarterback be willing to stay? Or will they look to leave, too? Remove Fields’ or Baldwin’s name – or both – from the chart below for 2020 or 2021 and imagine where the Buckeyes will be at that point. OSU is going to have to nail down a long-term strategy to land and keep depth at the position soon. That may mean taking more preferred walk-ons like Vanatsky, or taking two quarterbacks in the 2020 or 2021 classes. The Buckeyes typically don’t like to do that, but with the way the position is changing, they may soon not have a choice. An asterisk (*) means the player has already used his redshirt year. An ampersand (&) means the player is a walk-on. I agree that the Read Option is dying a quick death – however, the read option garnered three national championships for UB. One can argue that Car Dale Jones was not a Read Option choice but the read option likely got them there. Anyway, agree that CFB is changing – I think for the best (athletes) and worst (overseers). Tate was banking on the read-option coming back…I hope it never comes back as a primary offensive weapon. And I pray we never again have the QB Power Dive as our base play. That was just brutal. Yes, as previously mentioned in comments on related articles, there is ZERO returning productivity (meaningful, anyway) among the QBs, and people are pinning hopes on an unproven player who has yet to be granted an eligibility waiver. It’s a house of cards. Agree. The collegiate game is changing. In some ways for the better (protections and ‘rights’ for student-athletes), in some not (more professional-like mercenary things based on the very small percentage who will play or aspire to play at the professional level). The djinni is out of the bottle though, and the game we old-timers remember isn’t going to come back.